Are health IT leaders the superheroes we need to save healthcare? Maybe … or maybe not. Regardless, healthcare execs got the chance to feel like a superhero at the HIMSS opening reception Monday night in Orlando. 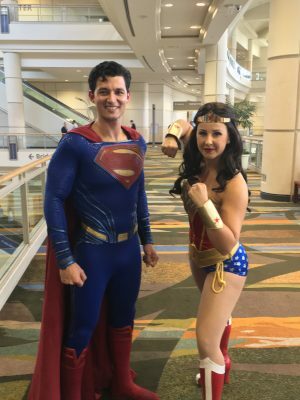 In keeping with the theme, a few of the most well-known superheroes heroes — like Spider-Man, Batman, Superman and Wonder Woman — stood by the escalators as attendees made their way up to the Valencia Ballroom in the Orange County Convention Center. I stopped by Superman and Wonder Woman, mentioning that I was a journalist and would like a photo. “I have a friend who’s a journalist,” Superman said. We chuckled and I headed upstairs to the ballroom, where music played and a few screens showed comic book-like speech bubbles with words such as “BANG!” and “WHAM!” Attendees were encouraged to dress in their favorite superhero costume, but aside from the occasional cape or mask, the majority of people were dressed like … well, like regular HIMSS conference attendees. The superhero theme of the opening reception is linked to the larger HIMSS 2019 theme: “Champions of Health Unite.” When reached via email, HIMSS senior director of strategic communications Karen Groppe shed light on this idea.